Tucked in one of HKV’s lanes, Studio SQ1 is a basement full of beautiful ceramics, handloom saris and edgy furniture pieces. The space itself is stunning and could easily make the cut for a bigshot home decor magazine’s set. Best part? Their stuff isn’t as pricey as you’d think! Scroll through Studio SQ1’s Instagram feed and you’ll fall in love (especially if you’re someone who loves minimalism and earthy colours). Their feed’s what got us to leave early from work and check out the space. Studio SQ1 is a basement studio in the Kunzum Travel Cafe lane that has been around for more than a year. 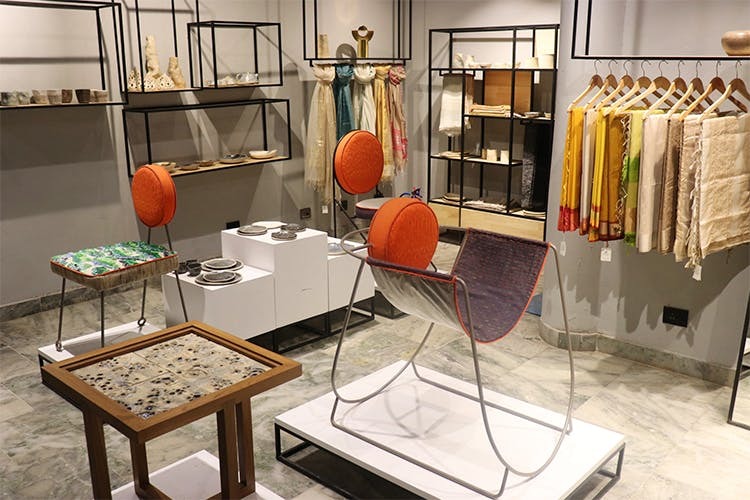 It’s a multi-designer store that’s got Maheshwari handloom saris, modern furniture pieces and more home decor from various designers across the country (like Maati, Mitre bow ties, Mangalam and more). Most of what’s displayed in the store includes the works of Studio SQ1’s four partners – Melvin Josy (graphic designer + interior products), Anumita Jain (ceramist + designer), Gaurav Chaudhary (textiles) and Bupesh Seethala (interior designer). One of our favourite things about this studio is that since almost everything’s handmade here, no two pieces are alike. Plus, they’re more than happy to customise everything. So, if you want to buy this rustic charcoal dinner set, but would like it better in a brighter blue tone or in a certain shape, it can be done. At the moment though, we’re eyeing this cool housefly lamp, the lovely ceramic glasses we saw at their studio and we’d happily gift one of Gaurav’s handloom saris to all the sari-loving ladies at home. When you enter a space like Studio SQ1, you’d expect everything to be super expensive but it’s actually reasonably priced. The handloom saris start at about INR 2,000, ceramics at INR 700 and furniture prices can vary depending upon your customisation requirements (the orange chair we saw is for about INR 30K; Urm.. we'll stick to the saris then). Check out their Facebook page and follow them on Instagram too.